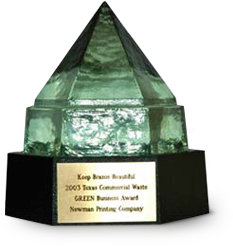 Newman Printing Company was the first recipient of the 2003 Texas Commercial Waste GREEN Business Award presented by the Keep Brazos Beautiful Association. Great ideas deserve to live. With today’s printing products and technologies, one can choose from a variety of avenues to bring your ideas to life. It feels good knowing that Newman Printing offers the latest recycled papers, environmentally friendly vegetable-based inks, and chemically free pre-press technologies in the area. Planet safe technologies at your fingertips. NPC collects and bundles thousands of pounds of paper and cardboard each month for recycling. Other significant waste products are leftover ink from the presses, metal offset plates and photographic negatives. In some cases, these recycling efforts pay for themselves. The ink, however, is disposed of at a not insignificant cost to NPC. We consider all of these operations good for business and good for the community. It may seem like a small thing, but we feel it is part of our duty as a good corporate citizen.